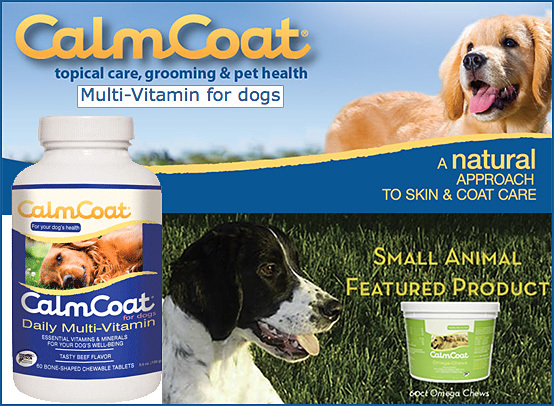 Calm Coat Animal Health Products are developed for a variety of therapeutic, animal health skin care issues using all natural ingredients as often as possible. Calm Coat was founded in 1996 by a private equine rescue operation that rehabilitates horses in distress. After seeing so many horses with severe skin problems, they came up with an all-natural alternative to the many, many trips to the veterinarian. Thousands of horse and pet owners have found Calm Coat products to be the answer to their animals skin and coat needs. Recommended by Horse Journal an astonishing EIGHT TIMES, our signature product, Calm Coat All-Natural Spray was created for the toughest horse with skin problems. Its unique and patented formula eases a multitude of problems such as sweet itch, general itching, insect bites, rain rot, fungus, sunburn, and scratches to name only a few. Calm Coat Natural Spray is excellent for horses, livestock, dogs, cats and other small animals. Hypoallergenic, soap-free formulation with optimal pH balance. Contains emollients for moisturizing and proteins for conditioning. Natural Moisturizing Factors promote hydration of skin and coat, while essential fatty acids nourish skin and aid in the control of flaking and scaling. May be used as often as necessary and will not strip the coat. Safe for use with topical flea control products.? ?Calm Coat® Premium Horse Shampoo ?Calm Coat® Premium Horse Shampoo thoroughly cleans the coat and leaves it soft and shiny. It leaves the hair shaft free of wax coatings, oil, petroleum by-products, silicone, or synthetic polymers found in other horse shampoos, thereby letting the hair accept moisture from the air as nature intended. Our all-natural topical spray works with the skin's natural ability to heal. Formulated for Horses and Small Animals, CALM COAT® Natural Topical helps provide relief for 50 skin conditions. All-natural blend of essential oils. Immediate relief from itching and scratching. Effective on 50 skin conditions including allergic reactions, insect bites, bacterial and fungal conditions. Encourages healthy skin and hair growth. Soothes and provides SPF 7 while providing quick relief of burns including sunburns. A little goes a long way! Concentrated formula provides over 350 applications per 8oz bottle. Recommended by the Horse Journal 7 times for superior relief! An ALL-NATURAL water-based formula using a unique combination of citronella and other botanicals without the use of harsh chemicals or pesticides. The result is a fragrant, gentle, non-greasy, non-oily spray or wipe-on for horses, ponies, and foals and is gentle enough to use daily. Repels biting insects including mosquitoes, yellow flies, black flies, no-see-ums, gnats, chiggers, ticks and deer flies. Eliminates tangles and knots providing effortless grooming leaving a spectacular sheen on coat, mane and tail that lasts for days. It makes the coat smooth and sleek while it repels dust, dirt and stains keeping your horse cleaner, longer. Not an oil or cream rinse. Not affected by water or liniment baths. Calm Coat® PreClip is a revolutionary grooming spray exclusively formulated to save time and stress for horses or dogs being clipped or trimmed. Calm Eyes® is an all-natural eye care solution that provides soothing relief for itchy, irritated, and runny eyes in horses. Don't let your dog suffer with itchy, scratchy ears that annoy or upset him. Specifically formulated to deodorize and gently clean, dry and acidify the ear canal, Calm Ears offers true relief. Pleasantly Scented. Will not sting or burn. Gentle enough for daily use. Ideal for dogs and cats. What Do People Say About Calm Coat Products? You are a miracle worker. Your product Calm Coat has saved my horse Holly her eyes, face and leg injury to grow her hair back. She is an "itchy" horse and has gone from being almost bald on her face to a beautiful horse. Her leg injury was so serious that we didn't think she would live. Now she doesn't miss a beat and has hair growing on scars that looked like 3rd degree burns. You have greatly helped us! Thanks so much. I have used Calm Coat products for years. Their Calm Eyes, Natural Topicals, Shampoos, Fly Spray-- the entire line. I have learned that I can ALWAYS depend on Calm Coat to give me consistent, great results for my horses and dogs and recommend their products to horse and dog owners everywhere. Calm Coat truly is a "cut above" and I love what they do for my animals. Make sure that Calm Coat products are in your tack room today! CalmCoat products are in many tack stores, and they can be ordered through KV Supply or call them at 800-423-8211.